Many of my clients have the same problem: they feel overwhelmed. We often feel overwhelmed with our responsibilities, ideas, desires, obligations, etc. It happens because we’re often trying to achieve all of these goals at the same time. The root of the problem isn’t in the very existence of those obligations, but in ourselves trying to meet them all simultaneously. Or consciously go after many of them at the same time. They aren’t alone. I found myself exhausted doing the exact same things. That’s why I took the time to look into and understand how I could change this. It can be put into 1 sentence: We are not omnipotent creatures, but humans beings. Even though our thoughts, therefore goals and desires, have no limits, our bodies do. And we need to remind ourselves about it from time to time. I learned about this hierarchy while studying economics, but I believe it’s an essential piece of information and should be taught in all types of schools. This information doesn’t help to just be productive but to also stay healthy at the same time. You can find a descriptive explanation about the Hierarchy of Needs on Wikipedia, or via any other (possibly more) reliable resource. In a nutshell: “Maslow’s hierarchy of needs is often portrayed in the shape of a pyramid with the largest, most fundamental levels of needs at the bottom and the need for self-actualization and self-transcendence at the top. …The most fundamental and basic four layers of the pyramid contain what Maslow called “deficiency needs” or “d-needs”: esteem, friendship and love, security, and physical needs. 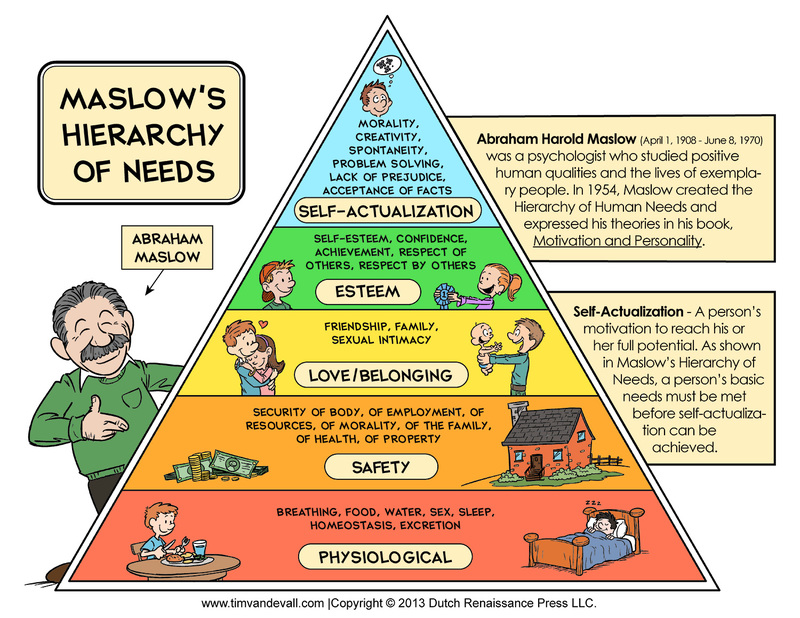 Maslow’s theory suggests that the most basic level of needs must be met before the individual will strongly desire the secondary or higher level needs. YOU ARE NOT AN EXCEPTION. – Satisfying the physiological needs and the rest of the first 3 before climbing to the top! In other words: if you’re in a place in your life where you have unresolved problems regarding where to sleep, what to eat, and who to talk to, it’s really not the time to add a new challenge, such as a career change. It doesn’t mean you need to wait until everything is perfect at home to pursue your Life Passion goal. But it’s vital to at least be physically ready and at peace with other essential parts of your life in order to do this. If health is an issue at the moment? Don’t expect yourself to change your career, get a degree and/or start a new business in the next month. Cover this physiological need first, so you have some energy left to direct towards your Self-Actualization one. If your mind and heart (and therefore energy) are occupied with family or love problems, stop pretending like it’s all okay while you keep pushing yourself towards professional achievements. Look at the pyramid and objectively assess how much of those needs are covered. And if your basic needs are completely fulfilled, you will then have 100% of your energy remaining to put into Working with Passion (which is Self-Actualization) right now. If the previous layer is not covered completely, you should thus adjust your professional goal accordingly (lower your expectations). It isn’t about giving up on your dreams forever. It’s about a healthy allocation of your resources: cover your basics first before climbing to the top.